This guide includes 3 methods to fix error code 0x80070652 in Windows 10, and all solutions are provided step by step. If you just encountered same error, keep reading to find out solutions quickly. The error code 0x80070652 is one of the Windows error you may meet during installing system updates in Windows 7/8/10, and it may also occurs to the process of installing some software like Visual Studio. Usually, it comes with error message ERROR_INSTALL_ALREADY_RUNNING which means another installation is running. Thus this error might relate to the clash of already installed update files and the one to be installed. Some users encounter this error in Blue Screen of Death (BSOD) environment. This error code can be found on all versions of Windows, but it is currently more common on Windows 10. Cause of error 0x80070652 can be different on different PCs, thus we listed several most common causes of this error. Multiple Windows installer processes runs at the same time. Windows cannot run multiple installers simultaneously. The error code means you should close extra installation. You can do that in Windows Task Manger and then process like setup.msi or setup.exe. Users are trying to downloading another application while Windows is upgrading system. Previous update installations issue. For example, previous upgrade process was not properly completely or has been damaged. It is not that difficult to deal with Windows 10 update error code 0x80070652. Here are a couple of solutions to fix it. Clean boot is a good method to many Windows issue, as it loads Microsoft services without loading any third party applications whose conflicts may lead to various errors. This solution takes Windows 10 as example to explain how to perform a clean boot. You should log on computer with the administrator account, as other account is not allowed to run a clean boot. Your computer may lose functionality for the moment when you run a clean boot, but functionality recovers after computer boots normally. If your computer is connected to a network whose policy setting may stop you from doing this, it is not advised configure settings in System Configuration utility without the help of experts. Step 1: Type msconfig in the searching box and click “System Configuration” from the searching results. Step 2: Click Service tab on the System Configuration dialog box. Step 3: Select Hide all Microsoft services option on the lower part and click Disable all button. Step 4: Click Startup tab and select Open Task Manager link. Step 5: Under the Startup tab of Task Manager you can see several items. Select each item and click Disable one by one. Step 6: Close Task Manager. Click OK button on System Configuration dialog box. Then Restart computer. Once your computer is restarted, you can check if the error code is removed. Step 1: Click the Start button and choose Settings to open Windows Settings. Step 2: Select Update & security Windows Update, recovery, backup on Windows Settings. Step 3: Click Update history to find an update that has failed to install. Click “Failed to install” to view more information. Take down the name of the update. Step 4: Open Edge or other browser and open Microsoft Update Catalog. Type the update name in the Search box and press Enter. Click Download button to download the update. If you have created a system restore point when the system works well. Perform a system restore can help you get back to the status when Windows operating system was backed up. After system is restored to previous status when error code 0x80070652 does not appear, then your computer will get rid of the error. Step 1: Right-click the Start menu to select Control Panel. Step 2: Search Recovery in the search box and open it. Step 3: Select Open System Restore and then click Next. Step 4: Choose the restore point that does not contains the error code, and click Next and Finish. If you have no idea on creating a system restore point, you can use Eassos System Restore to backup Windows 10. 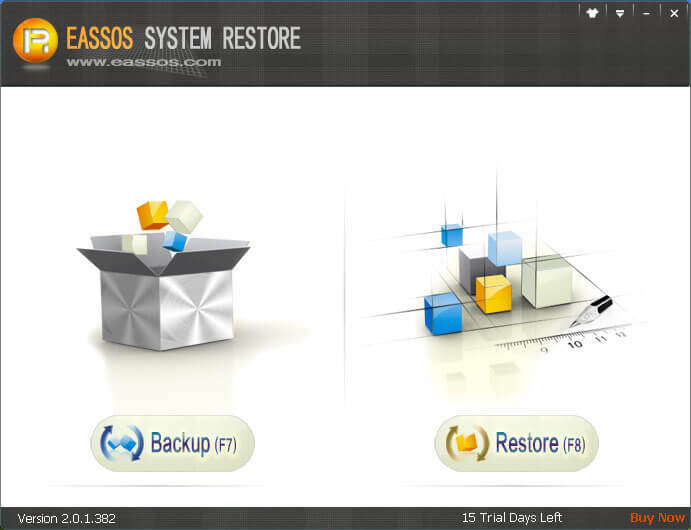 This Windows backup software is able to create a full backup of operating system as well as multiple incremental backups, thus you’ll have several restore points. It’s much easier to backup Windows, as what you need to do clicking Next button several times. Step 1: Install and launch Eassos System Restore. Click “Backup” button from the main interface. Step 2: Click Next button. If you want to configure advanced settings, click Option button. Step 3: Click Start button and Eassos System Restore will boots to the backup environment to backup Windows. Step 4: Once the backup process completes, computer will restart to Windows automatically. This entry was posted in Partition Manager and tagged 0x80070652, 0x80070652 Windows 10, blue screen of death, error code 0x80070652 by EASSOS. Bookmark the permalink.